Every M4 & SOCOM Universal Fake Silencer comes WITH an adapter. These are SPARE / EXTRA Adapters. The $25.00 price is a base for all long and short adapters. You will be required to choose from the "Individual Universal Adapters" drop down list (see above) as to Length & Thread Size. On this list most of the adapters are at no added cost to the base of $25.00. When you see the $10.00 (or other) that appears after the thread style... this is the ADDED / EXTRA amount you pay in addition to the base $25.00. Longer adapters are more expensive and the price will automatically adjust accordingly. 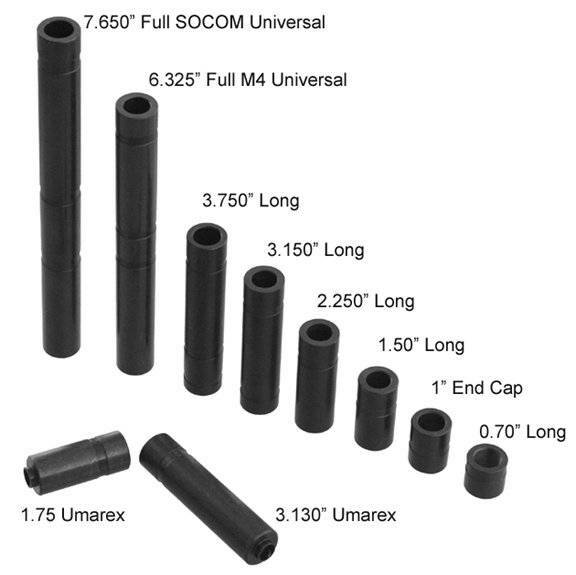 Maximum length is 7.650"
These are adapters ONLY for the MFI Universal M4 & SOCOM Style Fake Silencers. All Outer Diameters are @ 0.745". All adapters are made from Weapons Grade Steel and are coated with Mil. Spec. Black Oxide to match the Outer Bodies of the M4 & SOCOM Universal Fake Silencers / Barrel Shrouds.